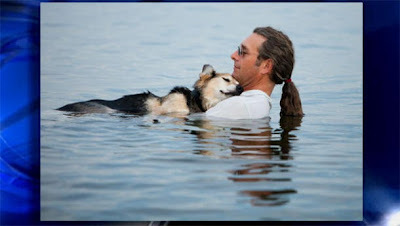 This photo of John Unger and his aging dog Schoep, by Hannah Stonehouse Hudson, took the dog loving world by storm. I bet we all remember seeing this unbelievably sweet photo of a man easing his 19 year old dog's arthritis by letting him fall asleep each evening in the waters of Lake Superior. But we always wondered about the details behind the photo and what became of this dog and his adoring owner. We found out today when we watched this CBS video. The rescued shepherd mix passed away a few days ago at the age of 20, and this video gives us a bit of the back story. May every dog have such a loving owner. Sad but 20 was a great age. Have a super Saturday.